A city within a city, with well-defined functions, a clear and hierarchically consolidated system and perfect, flexible logistics: in short, a micro urban framework that brings together all the activities needed to develop the production process of ceramic surfaces. The Casalgrande Padana headquarters is a combination of various buildings, plants and office blocks, all with a clearly – defined identity, which is essential in helping to transform a material that comes from the earth into a unique product, full of innovative content, quality and – despite everything – a future. The Casalgrande Padana world revolves around the earth in the most complete sense of the word, because the raw material is extracted from the earth, it is in the earth – or rather in an area that has this vocation – that the company has founded its roots and the skills needed to achieve excellence and it is once again the earth, or rather the environment, that it has focused on as regards themes of sustainability and energy saving. This ’green’ spirit is rooted in the company DNA, as is confirmed by Franco Manfredini, Casalgrande Padana President: “From the very first steps in our company’s long history of production, we have placed sustainability and health and safety at work at the forefront, engaging in dialogue with local communities and creating special projects aimed at social and local welfare. All this with the aim of finding the right balance between economic growth, innovation, respect for the environment and social responsibility. In our philosophy “Made in Italy” doesn’t only mean luxury and beauty, but also ethics, commitments and a sense of responsibility. These values have allowed us to transform a product into a shared experience”. 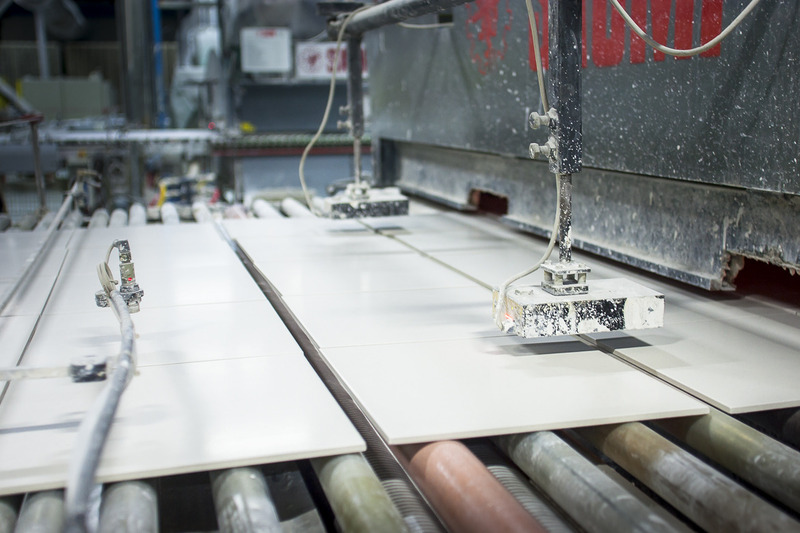 Casalgrande Padana was the first company in the sector, in the now far-off past, to focus on porcelain stoneware, and today this kind of product makes up 80% of its overall production. It is a material with excellent features and advanced quality which, however, requires a perfect production cycle in order to express its potential to the full, a pathway focussed on excellence that must start from quality raw materials. Clay from Europe, Italian sand, Italian or Turkish feldspar, talc and all other additives or complementary materials must be top quality. They enter the plant and are placed in various hoppers according to type and particle size. Raw materials are sent from the warehouse for production by an automatic calculator that specifically selects a material according to production needs. 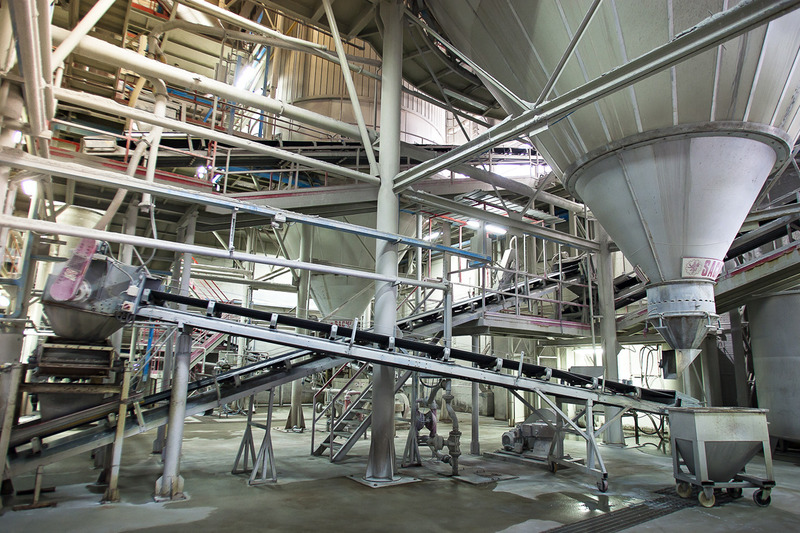 Once loaded, the material goes into special silos from which the correct amount is extracted to make up the mixture: the first real secret of production is the recipe, which calculates the right quantity of ingredients (base materials and pigments) needed to obtain the result desired. Water is added to the mixture that is obtained when it enters the grinding mills. The company has mills that are used to obtain different bases with varying base colours (pale, medium and dark). Inside the mills, which are divided into 3 chambers and rotate on their own longitudinal axis, the material is ground using high density sintered aluminium spheres and then reduced to a fluid state. This so-called ’slip’ is collected as it drips into underground pools. The material is then injected from the pools at high pressure into an air spray, in which it meet warm air, is nebulised and reduced to powder (the atomised material) with a perfect grain size. In this process the percentage of water in the slip (34%) is reduced to 5% of the atomised material, which is then collected in 100 silos of 450,000 kilos each. From these silos the atomised material is sent to presses, each one of which is prepared for a typical type of product, which compacts the material to the required size and thickness. The tile obtained, which still has no resistance, goes into the drying tower where it remains for approximately 2 hours. When the product has to be varnished, it only goes to the dryer after varnish and surface decorations have been applied. These can be applied using traditional roller printers or innovative digital printers that can create any design or decoration. Casalgrande Padana has gas ovens, inside which the temperature curve allows vitrification of the material to take place. There is then a sequence of pre-heating, softening and final baking (in which the product reaches a maximum temperature of 1,230°C) followed by cooling, with an overall cycle that varies according to the type and size of the product between 37 and 65 minutes. 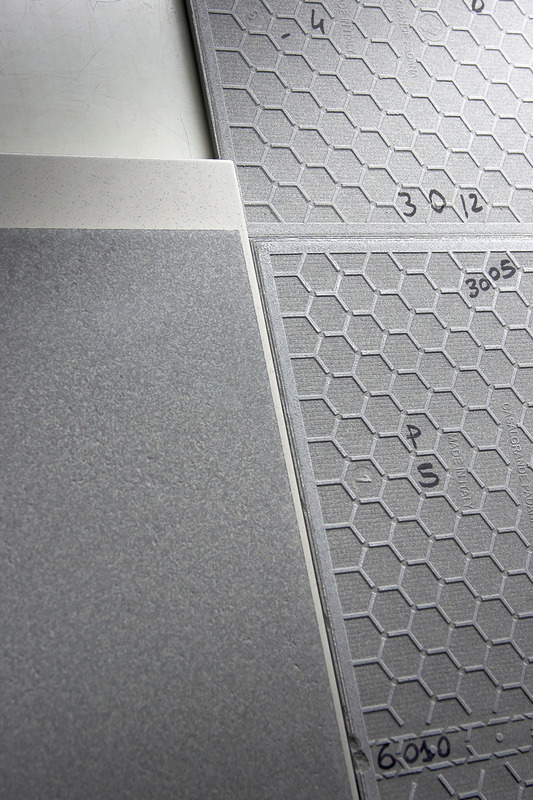 After baking, the appearance and colour of the tiles will be completely different compared to the raw material. During the design phase and the preparation of the mixture we therefore have to calculate for variations produced by the transformation of oxides and pigments contained in the mixture. As well as the aesthetic aspect, we also have to take size into account, by calculating how much the material will shrink during drying and baking. These comparisons are normally made using samples with tiles that are painstakingly measured after every phase of the process to assess the process itself, to check every parameter of reference and to confirm that what has been obtained up to that point conforms to established standards. 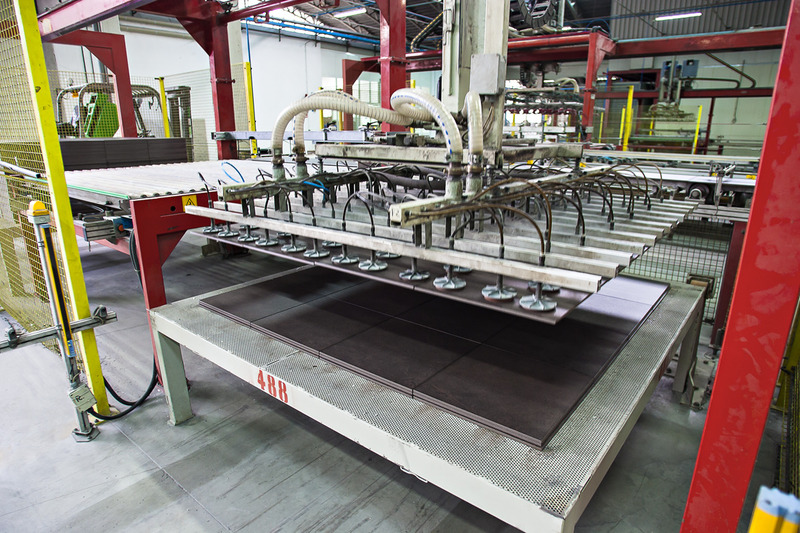 When tiles are removed from the oven, they are stored in the ’baked’ warehouse, from which they will be taken for sale or sent for rectification. This operation involves diamond-studded abrasive belts that remove excess material to obtain four perfectly rectified sides. Finally, all the tiles are automatically packed and sent for immediate delivery or to the finished product warehouse. The production process occupies a considerable area of the Casalgrande plant, which also houses offices and other vital spaces like the Creative Centre, a new building dedicated to design and training, a reference point for clients and visitors, architects and designers, a place that is in direct contact with the factory, able to combine innovation and creativity in a display, communication, technical information and workshop space. This is part of the wider programme of services offered by the company, an integrated system so advanced that it has produced Padana Engineering, a special structure to follow every phase of a commissioned project, assisting the client and meeting his needs in any context. Even during a serious downturn, like the one that the construction sector has been experiencing for some time now, Casalgrande continues its research activity and experiments with new mixtures and materials, to produce surfaces that are ideal for a wide range of applications: from traditional or ventilated wall facade coverings, to floors and coverings for interior design. From raised flooring for modern workspaces to floating pavements for exteriors (often with much thicker tiles). From industrial flooring to thin slabs, perfect for renovation. From solutions designed to get the maximum use out of public spaces and eliminate architectural barriers, to coverings for swimming pools. And last but not least, bio-active ceramics, a new and exclusive generation of products with absolute features certified for the reduction of their environmental pollution, self-cleaning properties and ability to reduce the main strains of bacteria. 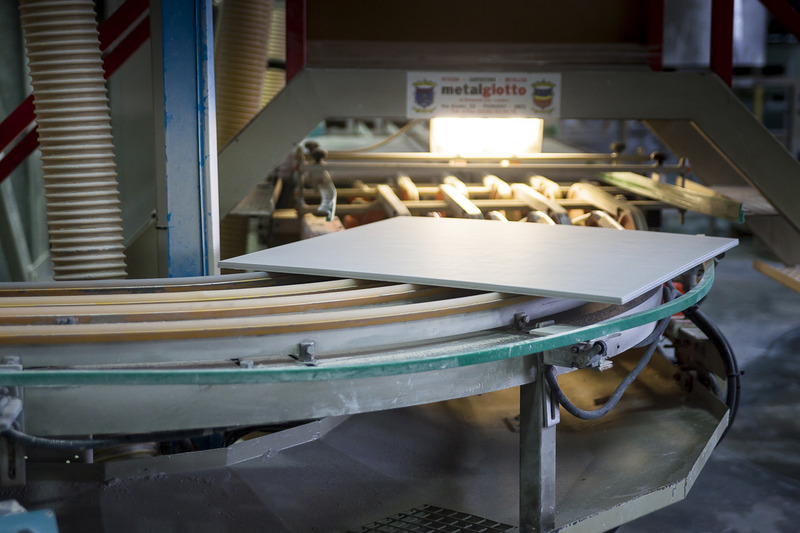 Casalgrande Padana produces ecological building materials using decidedly sustainable environmental procedures in its industrial plants, in a closed cycle productive process which permits recycling of all components with practically no emissions or dispersion. This absolute quality and wide range of products has lead to an extraordinary partnership between the company and designers. It is a constructive and beneficial relationship for both, which began in 1990 with the Grand Prix, a two-yearly award dedicated to architectural projects using Casalgrande Padana products. Many important partnerships with leading architects were born during the Gran Prix and then developed through loyalty, which is a tangible expression of professionalism and unique quality in the sector today. One is example is leading Japanese designer Kengo Kuma, who is in complete agreement with Casalgrande Padana’s philosophy and ability to innovate and who was an exceptional spokesperson for the company’s 50th anniversary. 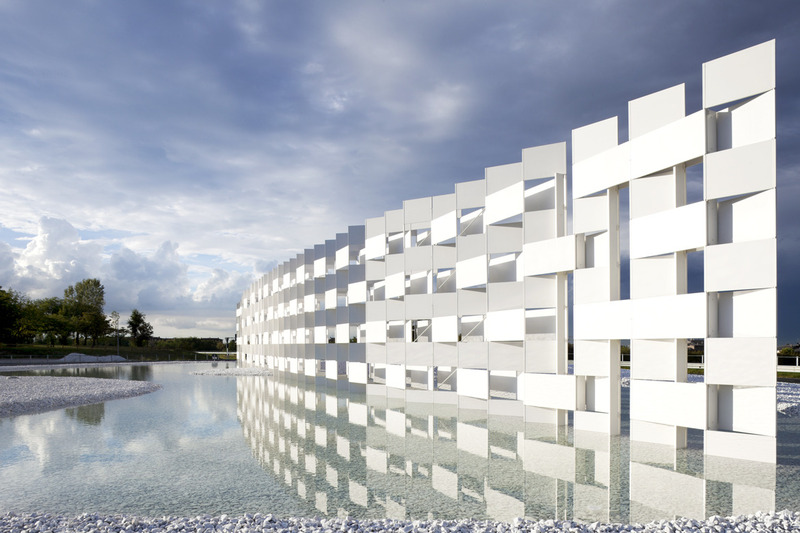 His creativity produced a spectacular architectural landmark, the Casalgrande Ceramic Cloud, a symbolic construction in front of the company headquarters that is a “Western Gateway” to the Emilia Romagna ceramic district. It is a project that combines architecture and land art, occupying a roundabout on the Pedemontana Road that runs next to the plant. The construction is over 40m long and 7m high. A different context, but the same ability to interpret a project according to one’s own approach and to express company identity through architectural choices can be seen in Old House, the interesting renewal of a typical farmhouse, located on the company’s production site, restored and recovered to be a historic archive and documentation centre for Casalgrande Padana, as well as a space destined to house exhibitions, meetings and cultural events. It is an extremely attractive space that contains evident traces of industrial memory, made up of passion and entrepreneurship, but which, thanks to its design by the Japanese architect, also becomes a contemporary space for the transmission of knowledge, for sharing experiences and for planning the future. The Old House is the paradigm and essence of Casalgrande Padana’s activity, a world in which tradition meets innovation, culture feeds innovation and a taste for what is beautiful and well-made combine to build tomorrow’s architecture.